An award-winning innovation & transformation consultant for over 20 years, his combination of strategic thinking and end-to-end pragmatism represents a fresh angle on today's business challenges and innovation opportunities. Marcus is a .com veteran with nearly two decades of award-winning, international and integrated strategy and technology project experience. 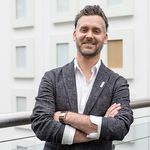 A Royal College of Art alumni and ex-MIT Europe researcher, he has accumulated an eclectic mix of technology projects in the area of education, luxury, automotive, advertising, smart networks & IoT, telecoms, entertainment, healthcare and fintech. Through work for clients such as BMW, Natural History Museum, Nissan, Science Museum, Leo Burnett, Mitsubishi, P&G, Kraft, McDonald's, GSK, Guide Dogs, Telekom Italia, Patek Philippe and a variety of startups and SMEs, he has created a very holistic understanding about the change people and businesses need. He his now consulting both global corporations and startups on innovation processes, service design and end-to-end strategies to elevate business benefits and capabilities. He believes that the future is deconstructed, horizontal and inclusive. He has been a speaker at international events and conferences and organised and facilitated workshops for various industries and company levels. He is the author of dozens of articles for both online and offline publications: e.g. Guardian Media, Wired Insight, Campaign magazine, NY Arts Magazine, etc. Success! The Deconstruction Paradigm sold 182 pre-orders by Nov. 4, 2018, was pitched to 82 publishers, and is in discussions with publishers. 1 Copy of the autographed limited edition of the book + Free invitation to the book launch. You ALSO get exclusive access to updates and an invite to join my community. 2 Copies (One for you and one for a friend) of the autographed limited edition of the book + Free invitation to the book launch. You ALSO get exclusive access to updates and an invite to join my community. Thank you so much to everyone who supported me. We hit 170 pre-orders and that means I will have 79 potential publishers looking at the book. I am humbled by you trusting in my abilities not just to write, but to make sense enough for you to have an ejoyable and thoughtful experience. I will send updates via this channel and the email list on news around the book and its launch date and will occasionally post around themes that are part of the book.